book, “Religion and Faith in Africa: Confessions of an Animist”. Fr. Orobator in the overview of his book pointed out that the work is born out of his own personal experience of his African culture. That culture, for Fr. Orobator, was his way and in fact, his people’s way of being human. To make him drop that culture may make him a better Christian, but maybe less human. He argued among other things that the African faith foundation made it possible for the two most prominent religions on the continent of Africa namely Islam and Christianity to thrive. For him, there is something foundational in his African culture to what he understands as being Christian today and we need to honour that foundation. Fr. Orobator pointed to Jesus Christ as the core of our faith. As a Christian that he firmly asserts, he believes that Jesus Christ is the Way, the Truth and the Life. He also believes that Jesus Christ would not be averse to any other way by which he can become more human. 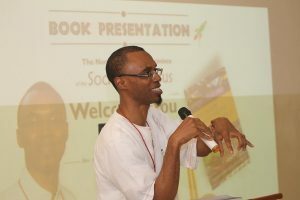 He summed up his presentation by stating categorically albeit humbly that his book is a controversial one but that he is telling his story in it and is willing to have a conversation on it. When invited to make a contribution, Sr. Theresa Okure SHCJ began by asking all gathered to thank Fr. Orobator for making the confession in his book, one that comes from his personal experience. 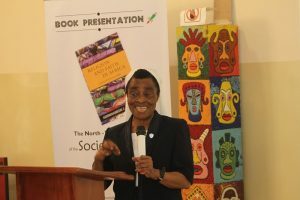 Playing on the title of the book, she highlighted that faith binds religion and Africa. It is important that each of us try to find out how we can hold religion and our individual realities together so that we can become who God wants us to be. She reminded everyone of a statement credited to Blessed Pope Paul VI to Africans that “You (Africans) can and you ought to have an African Christianity.” It is not possible to evangelise a people without first addressing their cultures. Thus, we need to find out how we can make our human identities part of the Gospel.